I recall reading this novel in the ’90s; my recollection is that the author was better-known for bad fantasy than for SF (but the SF of his that I’d read was better than his fantasy). The story opened in media res just before a battle was joined; there is a dialogue between the captain of one of the ships and one of his crew. We never see the actual battle; we instead see the conquest of Earth by the aliens - and the conquest of the alien homeworld by Earth. It is slowly revealed that the two sides contrived a way to both avoid the destruction of actual war, and solve their respective worlds’ respective problems of overpopulation, infrastructure decay, et multae ceterae. We also see that the solution was that the conquering aliens were secretly selecting Earthmen to rule their homeworld, while the humans were selecting aliens to rule Earth. About halfway through, there is suddenly a third world that must be ‘conquered’ and brought into the network. The plot gets complicated after that. 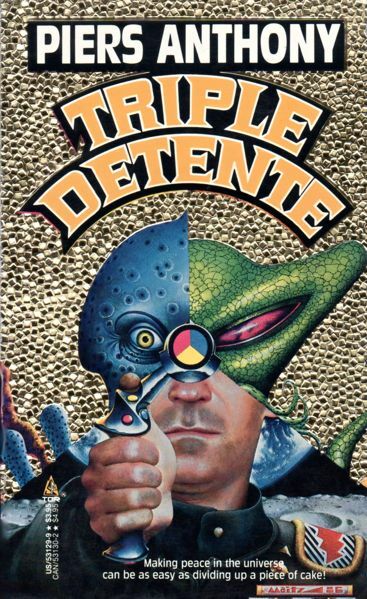 This sounds like it could be Piers Anthony's early novel Triple Detente (1974). Earth and Kazo have created a unique peace. Kazo administers Earth, and Earth controls Kazo. Nothing is really complicated until both humans and Kazos discover the existence of a third intelligent race in the galaxy and try to bring them into the newly developing peace. If I recall correctly, both planets have overpopulation problems, and their leaders secretly agreed to 'surrender' and let the other part administer their planets and do what was necessary (i.e., cull the populations). You might be thinking of the short story “Mother Earth”, which was anthologized in The Early Asimov. It's a story looking back to the war in which the Spacer worlds fight for their independence, isolating Earth completely for a while. The short story indeed begins in medias res, with a conversation apparently already going on. The very first paragraph is this provocative question. Gustav Stein, who delivered himself of that mocking question with a whiskered smile and a gentle wipe at the gray mustache from the neighborhood of which he had just removed an empty glass, was not a historian. He was a physiologist. But his companion was an historian, and he accepted the gentle thrust with a smile of his own. Read the full text of this novel as it appeared in the Astounding magazine.